In the first part of this series, I talked about podcasts, systems, and Omnifocus. After that maybe you decided to start listening to a podcast or two (Cortex, perhaps?). You purchased Omnifocus or some other app in which to dump your thoughts so they aren’t occupying your brain and you started thinking about how to improve your systems. I suggest bookmarking these posts and coming back to them from time to time for both my own shameless self-promotion and for a couple of other reasons. One reason is to ground yourself and get back to basics when things get crazy. Second, you might not be ready for the next step. Perhaps it’s been difficult getting into the habit of inboxing or remembering to capture your paper memos and put them into your cloud storage of choice. If you’re looking for a quick overview of Google Drive, check out the 60 Second Tech Tip video I made on it. Today I want to talk about timers. As teachers, we rely heavily on them. I always struggled with buying enough of them. I was glad to have iPads for my classroom because every iOS device and probably most mobile devices come with a timer built in. You can even just type, “20-minute timer” into the Google search bar and it will give you the option of starting a timer on the search results page. There are two timer apps in particular that I’m fond of: 30/30 and Due. 30/30 is great for sticking to a routine. This can be useful if you think you waste time getting ready in the morning, you want to do HIIT at the gym or if you do rotating centers in your classroom. The app is created by Binary Hammer. Check out their website or download it and give it a try. Due is another Grey/roommate recommendation (I’m starting to wonder if they’re just the same person). Due is actually a reminders/to-do list app, but the timers are where the power lies. You can create custom timers and when they go off, you can snooze them for a minute. At which time, they’ll pop up and remind you again. I used to set a stopwatch to track the amount of time I did something. When I was done doing the thing, I would record the time on the stopwatch. The problem with this was I would often get distracted or forget that I set the stopwatch going in the first place. With Due, I make it a set amount of time and it’s a countdown instead of a count up. I find this helps me stay focused because I know that at the end of the countdown, I’m going to take a break (see: Pomodoro technique). Another app that I’ll give a quick mention to is Coffee Break. I like that Coffee Break puts my screen to sleep after a designated time. I have a tendency to keep working even though the timer goes off. Sometimes that’s good, but sometimes I forgo my break as a result which is no good for productivity and focus. Another reason I love Due, it keeps track of how long it’s been since your timer stopped. Thus, I know if I’ve spent an extra two or ten minutes working. Sometimes it’s amazing how quickly time goes by. This whole timer thing might feel too regimented and stressful, but it goes back to reducing or eliminating resistance. If I don’t have to think about what comes next, it stresses me out a lot less. Do you use a timer system? What systems have you tweaked or put in place in order to eliminate or reduce resistance and stress in your life? Share in the comments below. Last time I talked about podcasts, one specific podcast I dig, Cortex, Omnifocus, and the importance of systems. Systems keep you focused and eliminate resistance. One way to reduce resistance is to reduce choice. Then, practice until it happens automatically. When you get a piece of paper at a meeting, what will you do with it? If you don’t have the habit in place, you’ll get back to your room, desk, or office, toss it on the table and it will slowly grow to an untenable monster pile that consumes your soul. Once you decide on digital cloud storage that is accessible anywhere, commit to putting everything there. Reinforce the habit. For the one minute version of how to get started, check out the 60 Second Tech Tip on our YouTube channel (subscribe while you’re there). If you know that the response to getting a piece of paper is to take a photo, store it in your digital storage (Google Drive, Dropbox, whatever) and then throw the paper away, that pile never comes into being and then, later on, when you’re looking for it, you can find it. They’re great as a redundancy, but not as a primary storage place. If the flash drive gets destroyed because you stop fast and a gallon of milk crushes it, your p lans are gone and there’s nothing you can do about it. The same applies to saving only to your computer. Remember: Digital storage should be accessible from anywhere, not just your devices. Practice with low-risk material first. Take photos of pigeons and things you don’t care about. Save them to your cloud storage and then delete them later. This will be low risk enough that if you mess up, you won’t be upset if you make a mistake and lose information. That’s a good habit to get into anytime you’re trying something new. The more you’re willing to take risks and try new things the better you’ll get. Go sign up or set up your cloud storage space. Play with it. Save some pigeons there. Pay attention to areas where you can eliminate resistance and create habits of automaticity. Here at Hoodlum Central, we believe in Design Thinking. We integrate it into most things we do and it’s been pretty fruitful both in our day jobs and in our business practices. No matter which flavor of Design Thinking one subscribes to, ideation is essential. You can’t prototype anything if you don’t have a smorgasbord of ideas to play with. While Webs and I generally do this with the Googles, I recently came across a tool I hope to use during my 9-5 hustle. Pitchcard seems like a promising tool to use in a classroom looking to encourage designing. Pitchcard allows you to ideate publicly if you wish. You title your idea, choose a color, and then write a brief (200 word) description, which I think is awesome. Being forced into being concise allows one to hone the “spirit” of the idea more authentically in my opinion. Once your idea is placed on the card, you can distribute it publicly on social media or privately via email. The feedback that your idea garners is sent to the email that was entered which hopefully allows one to refine the idea into a better concept. If you are at a GAFE school, one could utilize this tool pretty easily. Everyone of your students would have an email address, giving them the ability to send ideas to classmates efficiently and to archive the feedback so that it could be referred to when needed. Generating feedback on ideas for projects and writing assignments just got #mosexy. Looking for thoughts about what students learned during class? Don’t want to create a Google Form or use Exittix? This is a pretty streamlined way to gather information from your students about what they learned or struggled with during the school day. So you want to know if your lesson was the bomb or just bombed? Send a Pitchcard to your students and allow for feedback. Send a Pitchcard to colleagues about an idea for your have for that quantum physics lesson and see what they say. Say you’re a teacher with very little technology at her disposal and you’d like to use the tool. If you had a classroom email or social media setup, you could have students generate ideas that could be posted for feedback and then disseminate that feedback to students. Class project could be #mosexy if you sent a Pitchcard rather than used snail mail or limited contributions to conversations in the room. In short, Pitchcard is a tool I hope to roll out next week during my day job. Students will be pitching video game ideas and Pitch could be a very slick way of making students feel even more empowered. On my unexpected day off, I looked for ways to keep myself busy. I woke up at about 5:30am and composed some emails. I then realized that the NCAA tournament games would be on, but not until 10 or so. So I did what any responsible person would do to kill time…I played video games. My favorite game to de-stress is Titanfall. It’s an old game at this point, but it still gets my adrenaline pumping. What’s more fun than piloting a machine and killing other players with high powered weaponry? It’s played totally online as a multiplayer so there must have been quite a few other people with pneumonia today because I didn’t wait long to get games going. While I ran around with my Sniper rifle, Spitfire, or Shotgun, I began to reflect on the lessons playing the game had taught me. When I first started playing, I was rather shy. My technique was to hide in buildings and avoid dying senselessly. My movement was calculated and I would consistently score the lowest on my team. This of course made me mad as I would have liked to be an asset and not a liability when working as a collaborative. I began to look very closely at the scores. It became apparent that even those that had died more often than I had, many times still scored higher. My risk aversive behavior was not rewarded by the scoring matrix of the game. It was I will not dying as much as the other players, but I was not killing pilots, grunts, specters (robots), and Titans as often either. My fear was stopping me from advancement. My being ‘cautious’ stopped me from advancing. The other disadvantage to playing maps online it that the first dozen times through you can’t really strategize because you have no idea what the maps actually look like. Other players will ambush you and use your ignorance to their advantage. By soldiering through this, and endearing the often painful blows to one’s ego, one begins to understand the WHERE that allows you to do the HOW. You begin to memorize the placement of walls, where other players will respawn, and which weapons to use in which situations. There is no shortcut to this information. It has to be played through to be realized and appreciated. It is often this way during class. Students would like things to be explained to them that have to be experienced to be understood. This is why hands-on learning is so powerful. This is why field trips are so powerful. This is why speaking to one another is so powerful. Teachers are often in a hurry for students to “get it” rather than being patient with them and allowing them to make the connections necessary for successful. Often a period of patience in the beginning will allow a student to advance far more rapidly later on. One of the things I had to do very quickly is get over myself. I didn’t really understand this until I was playing against a team that each had their mics turned on during the game. No one on my team had their mics “hot” and though mine was plugged in, I was silent as I didn’t want to embarrass myself. The team with the microphones DESTROYED us. They coordinated their attacks and isolated the players on my team. There was no way for use to combat this as we were all silent. If you don’t work together in a tangible and authentic way, you can’t accomplish very much. That team kicked our butts 3 more times before we got wise to their strategy and began using our microphones. Many times, we feel weak when we ask for help and the need for collaboration is often interpreted as “I’m not good enough on my own.” We often wish to suffer rather than admit that a different point of view might be what’s need to be successful. I’ve never seen a team of Pilots not using mics defeat a team all using mics since I’ve been playing. There’s got to be something to that. eHighligher is a pretty nifty way to integrate both physical books and technology into your close reading activities. The app is reasonably priced at $1.99 and offers real value with minimal risk. Say you are using a text book, reading a novel with your students, engaging in research, or having students read independently with certain goals in mind. You have iDevices at your disposal and you want to integrate notetaking and transcription into the activity. eHighlighter could be a tool you might employ. The first thing I love about the app is that you can acquire a books bona fides (title, Author’s name, and publisher) by just scanning the book’s barcode. The app uses WorldCat, “The World’s Largest Library Catalog,” for reference and the speed in which it returns results is impressive. If you’d rather search for the book and edition you possess, that option is available as well as just manual entering the information. Then you can bring in your text pretty easily. Once the picture is added, you’ll have options to add page numbers, any notes and tags, which will give you the ability to organize any work you’ve done. Want a response to a text dependent question? Want to record an “Aha!” moment, a question about the text, or something to bring up during class discussion? Make a note of it. Notes for Metacognition? That’s convenient. 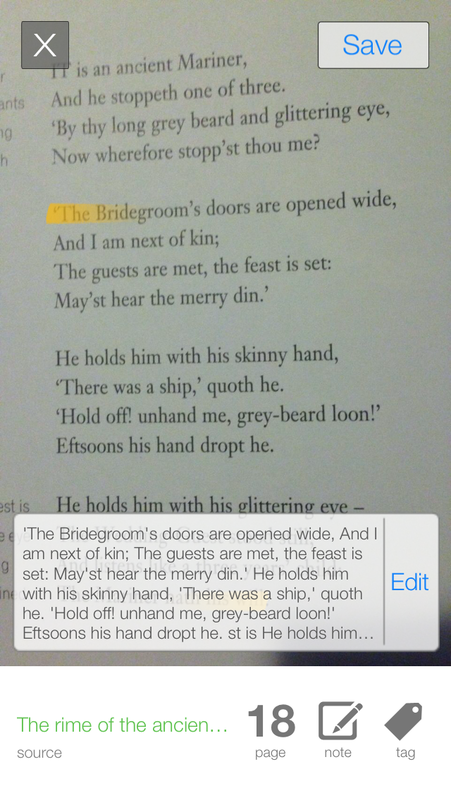 You’ll be prompted to add highlights to the beginning and ending of the text you’d like to have transcribed. This is my only real beef with the app. It can take a while to transcribe something. The good thing is that I wouldn’t necessarily be using the device for transcription as the original image and note you take are always available for viewing. Even if the transcription process is labored, the functionality of the app makes it one that both teachers and students could use effectively. I am sitting in Austin-Bergstrom International Airport and I just ate some weird tacos. They weren’t like tacos I was used to that had chili powder and cumin to season them. I’m pretty sure it was just salt and pepper. They weren’t bad. They were just different. It got me thinking: Just because you sell tacos at a restaurant doesn’t mean those tacos are good and your recipe for tacos might not be the same as my recipe, but if all you ever eat is your own tacos you’ll never know any better or different. Then, like almost all ideas I have I thought, “It’s like the classroom.” Probably one of the greatest crimes is that we never get to taste other tacos. We don’t get to see other teachers in action very often. You might say, “But, Webs, what if I, or my teachers, see a terrible teacher in action?” Great!! Now you know what not to do! You use non-examples in the classroom right? Guess what? They work in life too!! Crazy! I know! Then I took it a step further. What if, for one school year, all the money normally spent on outside PD and conferences – time without kids – was spent on subs or whatever was needed to allow teachers to go watch each other teach when they had actual real life children in attendance? Yeah, not just adults pretending to be 8 year olds. Let’s face it, kids are like CEOs, we only get them for a short time each day and they can’t reschedule. What if the teachers shared feedback and ideas before and after observations? With each other. With admin. With themselves via reflections. No outside paid for PD. Just observation. What if they kept portfolios along the way to demonstrate how they learned from the experience using tools we mentioned in the NEPF post?